All you need is one place in your home or office that gets one bar of AT&T 3G, 4G or LTE coverage. Just a little bit of 3G, 4G or LTE signal strength and our revolutionary new Cel-Fi will bring you blazing fast downloads, smooth video and surfing, and improved voice coverage. AT&T Quad Band LTE, 3G and 4G HSPA+ on 3GPP band 2, 4, 5 and 12. LTE and 3G/4G. Up to four bands with channels of 5, 10, 15 or 20MHz to support up to 35MHz of boosted bandwidth. 10 times more gain than the earlier version. Automatic configuration in the selection of UMTS/HSPA+/LTE bands. Same plug-and-play functionality means no need for external antennas, cabling or subscriber configuration. 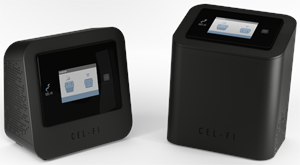 Cel-Fi Pro is quite simply the easiest booster to install, ensuring users have a strong cellular signal within minutes after plugging it in. Color display screens deliver an easy-to-use graphical interface that provides a whole system view of installation and device status to maximize system performance. Enhanced echo cancellation delivers an improved signal throughout the coverage “bubble”. Full support for VoLTE to ensure continuous high quality voice calls, while simultaneously streaming high-speed data to other users. “Smart” band selection determines the most efficient and best quality bands in real time, including LTE channels that were previously too weak to register signals. Self-Organizing Network (SON) capability auto-configures, optimizes, and manages how Cel-Fi Pro fills gaps in indoor coverage. It also enables the deployment of the smart signal booster as part of small cell networks in enterprise environments. the use of signal boosters. Some providers may not consent to the use of this device on their network. If you are unsure, contact your provider. weBoost Connect 4G X cell phone signal booster amplifier with 5 bands. Wilson AG Pro Quint delivers up to 70 dB of gain and supports CDMA, GSM, EVDO, LTE, HSPA+ and WCDMA. zBoost ZB575-A is a 4G LTE cell phone signal booster for use with Verizon wireless network. High performance tri band signal booster that provide coverage up to 2,500 sq. ft. zBoost ZB575 signal amplifier.